Ok, so here’s the thing: keyword research is in a weird place right now. On the one hand, it will always, by definition, be a core process in SEO: if you don’t have keywords to attempt to rank for, you’re basically just flinging content at the wall and seeing what sticks. On the other hand, Google really really really wants everyone to stop this whole ‘targeted keyword’ stuff and just get back to writing good content for the sake of good content, and they’re doing everything they can to penalize anyone they can catch at keywording anything. So it leaves webmasters in a bit of a bind: do they do the effective thing that risks Google’s wrath, or the less effective but more sure thing? I’m not going to attempt to answer that question for you — only you understand your own risk tolerance. Instead, I’m going to talk in extraordinary depth about what keyword research actually looks like. Because who doesn’t love ninja? No, seriously, I picked this niche because it’s not mainstream but it definitely has a strong subculture, so we know there will be demand and competition. The first tool to bust open in your quest for keywords is your brain. Grab a napkin and a Sharpie and write down the first 10 things you would Google if you were looking for martial arts supplies — and try not to be too repetitive. So I covered my basics — Martial Arts XYZ — and then we got into some specific things that will most certainly lead me to a much broader set of pages than the first four would have alone. As you look at this initial burst of search terms, you should be keeping in mind how you’re going to monetize your website. 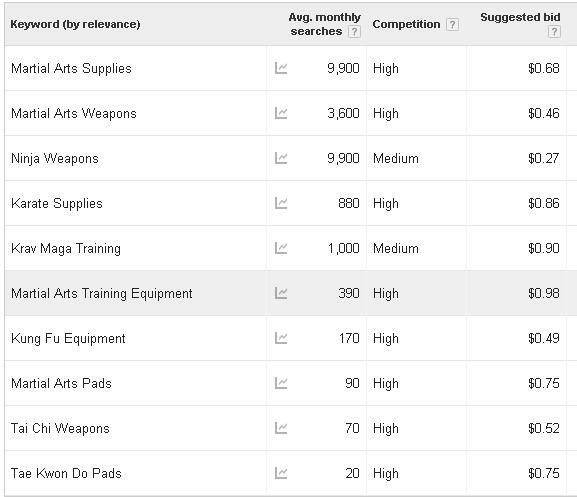 A website that intends to sell martial arts equipment will arrange its keywords very differently than one that intends to act as an encyclopedia of arms and make it’s money from on-page advertisements, which will again arrange keywords differently than someone trying to sell an eBook on pressure points and street self-defense. If you’re selling weapons, for example, you really can make ‘wakizashi’ a keyword — but if you’re selling an eBook on pressure points, you’ll want keywords more like ‘dim mak’ and ‘chin na’, and if you’re hoping for advertising money, you’ll actually want to sculpt the content of your site around whatever keywords you come across that have ridiculous volume and minimal competition. Now, so far we’ve done what everyone does: use the obvious ones and Google’s suggestions. But that’s just barely scratching the surface of keyword research, so let’s get a little deeper with a few less-known but still awesome tools. Grok is a unique SEO tool that allows you to see how many views a given Wikipedia article has. Because Wikipedia often shows in the first few results of any informational search, and gets clicked a lot, looking at views in Wikipedia can give you a roundabout look at traffic patterns. But that in an of itself doesn’t seem that useful — you need another piece of knowledge to go with it, and that’s a list of the Wikipedia pages that Google thinks is most relevant to your Duh-list search term. 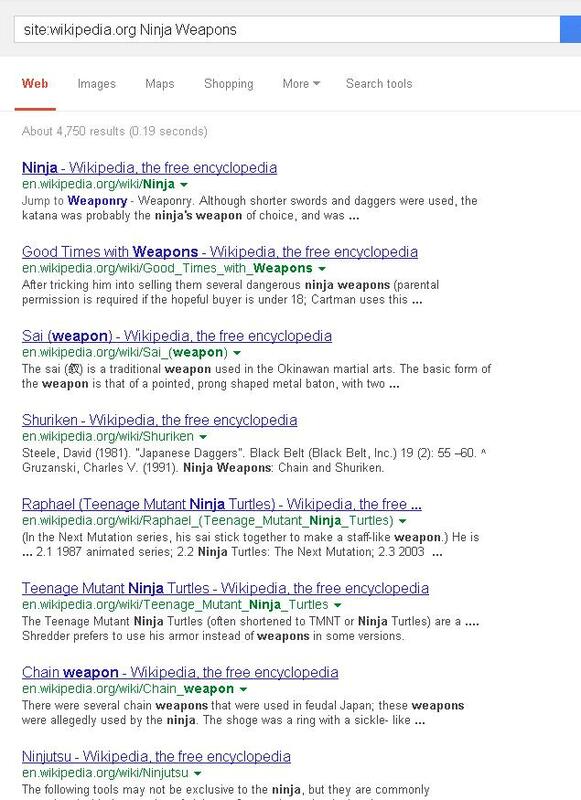 So, I’m going to go over to Google and type “site:wikipedia.org Ninja Weapons”, and see what I get. So, I go over to Grok, not really knowing what to expect, and I discover that the Sai page has been visited 27,000 times in the past month. The Shuriken page has been visited 22,000 times, and the Chain Weapon has been visited 1,700 times. So even if I knew nothing about the industry, I could tell right off that chain weapons aren’t the thing to try to sell — Sai and Shuriken, much more so. Obviously, this trick won’t work with every niche — I’ll admit it’s only moderately effective in the Martial Arts niche — but especially when you’re getting into a new niche that you haven’t steeped in for years, it can be an extremely good arrow toward the things people are most interested in. Just don’t follow too carefully — remember that most people on Wikipedia are looking for information; very few are looking to buy from you. “Visitors found this page by searching for”. That’s because some amazing person made a vbulletin plugin a while back that puts all of the search terms that have led to any given page on a message board (that has the plugin) on the bottom of that page. In a cute little window that starts: “Visitors found this page by searching for.” So, for example, if I type into Google “Visitors found this page by searching for” “Ninja Weapons”, I get…well, bad example, because I get the Ninja Weapons Mod for Minecraft II Forums and that’s about it. But believe me, it works for a surprising number of niches. Just not a lot of vbulletin forums out there debating the advantages of the kyoketsu shoge versus the kusari gama, I guess. Essentially, what you do with this trick is look up your core keywords and then scrape the rest of the list of ‘keywords used to find this page’ and look them up to see if any of them have good search volume and low competition. 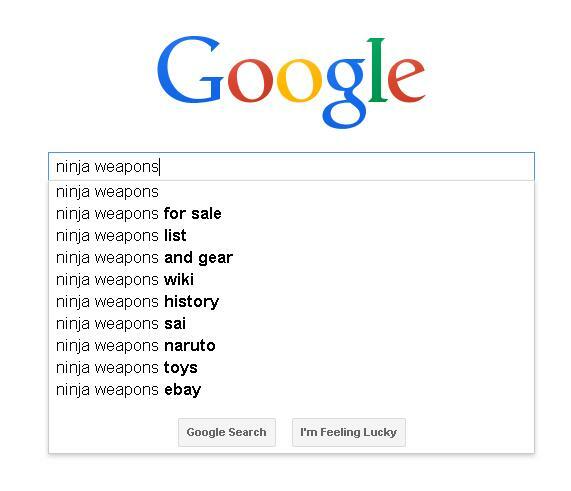 Now, it doesn’t take a lot to tell that ‘Ninja weapons list’, ‘Ninja weapons wiki’, ‘Ninja weapons history’, and their ilk are searches by people looking for information, not to buy something — so unless my monetization is through advertisements, I’m going to leave those alone and stick with ‘Ninja weapons and gear’ and ‘Ninja weapons for sale’ — but that’s two solid-sounding keywords that I might never have thought to look up, and it took all of three seconds of effort to find them. Running all of your core keywords through Google Instant is just plain good for you. This trick also works — and can get you some interesting different results — on Yahoo, Bing, and even Topsy as well. Now, a moment’s look at this will show you how it works. First, I selected the three words in bold, that I typed in. Then, I grabbed the little blue box that shows up in the lower-right corner of the ‘selected’ outline, held Ctrl, and dragged that blue box down by 25 or so lines. Google Spreadsheets accessed the database from the now-defunct Google Sets project, and filled in a bunch of keywords related to my initial three. Then, because I wanted more, I grabbed the little blue box again and dragged it to the right by several columns. 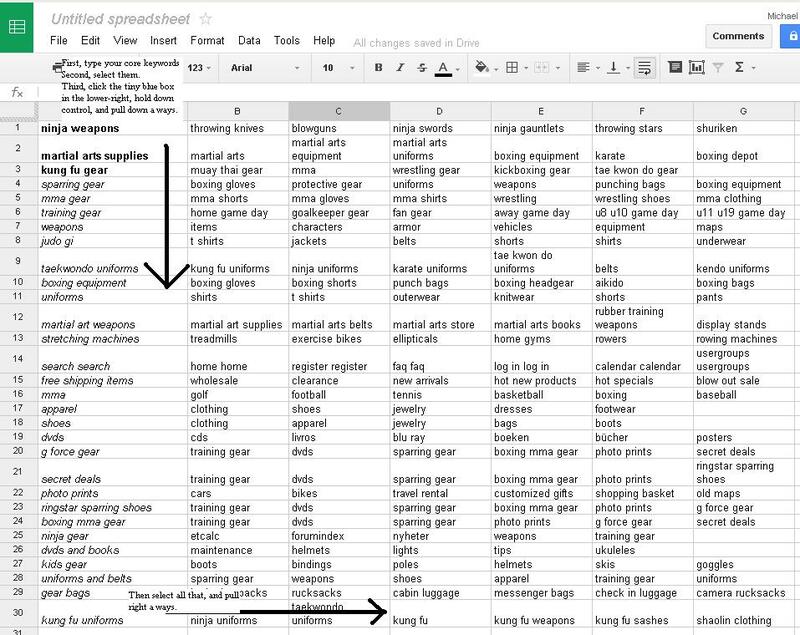 The keywords to the right of any given row are based strictly on that row’s first-column keyword, with no relation to the initial three that generated that first-column list — as you can tell because things like “skis” show up under “kid’s gear” even though they don’t relate back to martial arts. So the more steps you go, the further you’ll wander from your initial keywords — but look at the great ideas that are hiding in there. MMA clothing, ninja outfits, punching bags, rubber training weapons, boxing headgear — there’s a lot of inspiration in here if you’re willing to separate out the chaff. The keyword has to be relevant. The keyword can’t be a ‘tire-kicker’ or information-seeker’s keyword. The keyword has to have some clear search volume — we don’t want to waste effort ranking for keywords that get three hits each day. Now, lots of people ask “how much search volume is enough?” To that, I reply “That depends.” If the competition is low enough that it seems easy to rank for, I’ll chase down a keyword that gets 100 searches per day. If the competition is really stiff — like in the weight loss or stop smoking niches, for any keyword that isn’t a long-tail — I won’t bother unless there are tens of thousands of searches per day. In order to really build your keyword list, start by learning a neat tool called Ubersuggest. Ubersuggest takes your keyword of choice, adds ‘a’-‘z’ and ‘0’-‘9’ to the end of it, and then gives you a variety of suggested search terms that involve those initial letters or numbers. It’s simple as pie. Now, quite obviously, most of these are crap. Ninja weapons made from paper, Ninja weapons minecraft, Ninja weapons naruto…none of these are going to help you sell martial arts supplies. 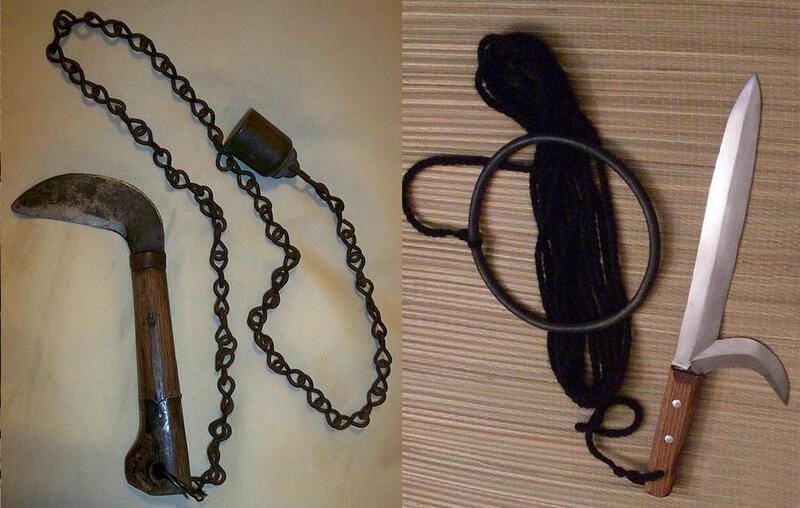 (Actually, Naruto might if you can find replicas of the weapons that appear on that show. Assuming there are actually weapons on that show somewhere.) But as long as you can use common sense in weeding out the garbage, Ubersuggest will show you lots of solid leads you probably didn’t think about. But what if you don’t want ‘terms that start with an existing phrase you already thought up’? What if you want entirely new search terms? Simple enough — there are lots of tools out there that can give you new ideas based on old ones. WordStream, WordPot, SEOBook, and Market Samurai. Once you have a list of the suggestions from these sources, and you’ve filtered out the crap, you can stick anything with 1-3 words back into Ubersuggest and find even more! This, quite frankly, is the step that separates the SEOers from the solopreneurs hoping to find a way to make money on a shoestring budget. Building the list — that’s pretty easy. Getting accurate numbers about the list so that you know which keywords actually have the best traffic-per-competition ratio…that’s either a $150 investment or a crapload of work. Sure, you can upload your results to Google’s Keyword Planner and see that the competition is “high”, “medium”, or “low”. Or you can type every single one of your hopefully thousands of keywords into Google and record how many competing pages there are…or you can upload the keywords to Market Samurai and get actual, real numbers on both competition and traffic in a matter of an hour — and you can go eat a sandwich and enjoy an episode of Scandal while the program does all the work. There are several other excellent tools that do the same thing, mind you. I’m not about to tell you that WordTracker, SEMRush, LongTailPro, and Moz Keyword Analysis don’t kick tail, and I may well bust out any one of them from time to time when I feel like they’ll be appropriate for a specific project. In general, though, I don’t believe in paying a lot for redundant software, and Market Samurai gets the job done. And that’s how keyword research is done these days, boys and girls. It’s just like that old saying: you got your quick, your cheap, and your good — but you only get two at a time. Big-boy tools like Market Samurai and WordTracker are quick and good; combining multiple free tools like UberSuggest and Google Spreadsheet-sets are good and free — and you don’t want to bother with quick and free, because if you don’t have good, you aren’t going to be in business for very long at all. Next Friday, I’ll go in-depth again on a related subject: analyzing your competition and seeing how they’re doing with they’re SEO and keywords and whatnot. It’ll be a trip; hope you join me then.